Woaaaah I love Urahara in his Captain haori. So cool! I love shots of Kisuke's fluffy hair. He actually looks kind of serious, for once. great scan i love how renji acts so carefree. nothing beats when there's Urahara in the pic! love it when he's in his captain form! btw you mean Fade to Black and not Fade of Black? is this a scan from guide book ?i want to know please.thanks. Renji is one of the best characters in Bleach!Thank you! 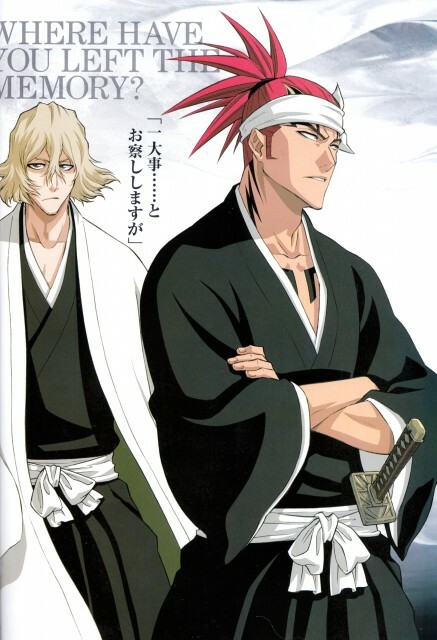 Renji looks kinda weird cuz he's looking to the side sorta...looks like he has no eyballs but I love it anyway. I <3 Renji. Urahara san looks good in a shinigami uniform and no hat. He's awesome too. "Where have you left the Memory...."
Nice scan! Thanks very much for sharing! Thanks a lot for upload this scan! wooow very amazing and super cool scan !